My Northfield photography exhibit (Near-Far Northfield) opens in the Northfield Senior Center Gallery next Monday, September 9 with a reception from 5-7 pm. The exhibit runs through Oct. 13. I started taking photos of Northfield and its community events in 2003 and publishing them on the Northfield.org and Locally Grown Northfield website. My online gallery has over 300 albums with 15,000+ photos. 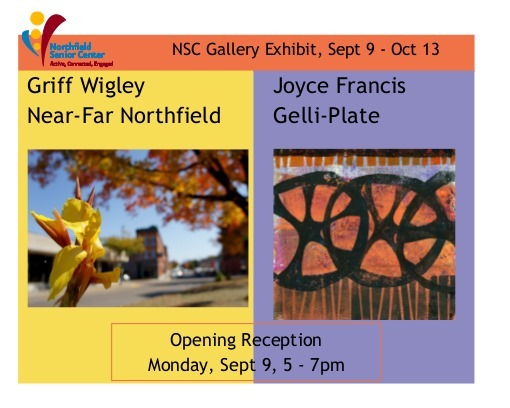 For this exhibit, I have selected images that feature close-ups of various objects with identifiable scenes of Northfield in the background. 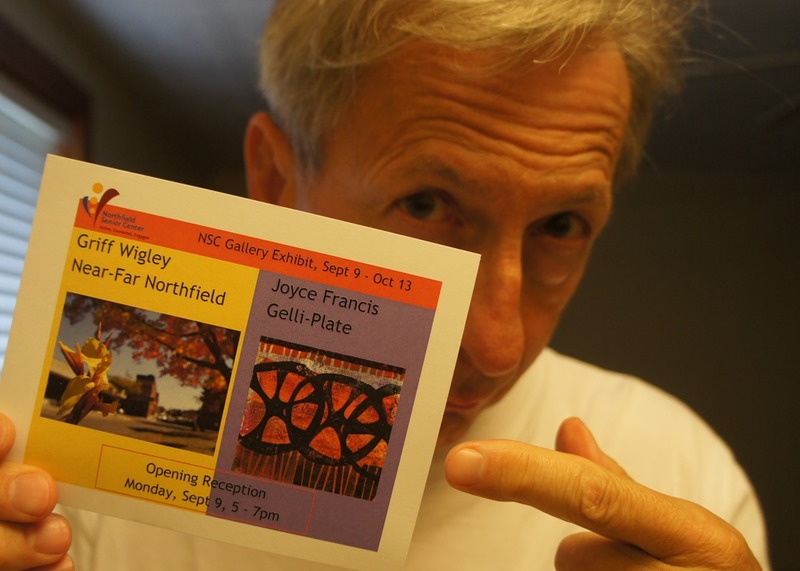 All but one of the photos in the exhibit are Northfield-themed macros, hence the show title Near-Far Northfield. 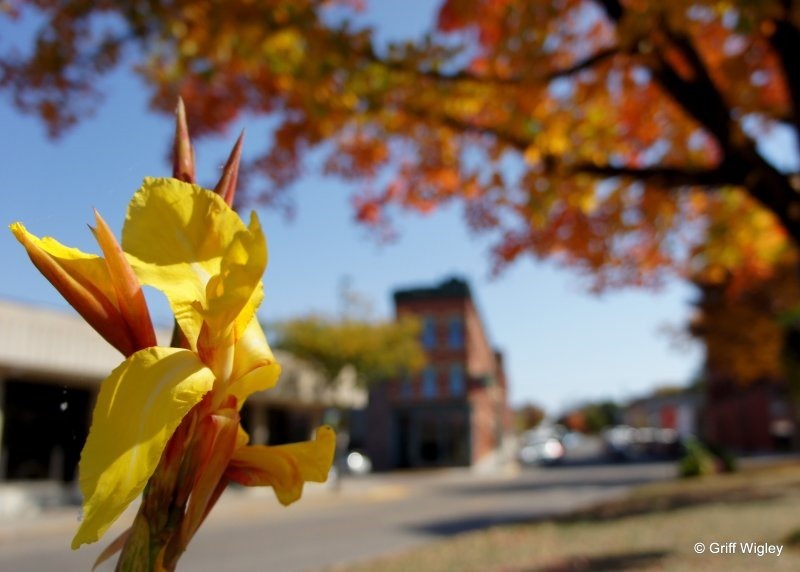 The photo above of the flower on Bridge Square with the First National Bank of Northfield in the background is one that Patsy selected for the show’s publicity post cards. And yes, the photos in the show will be for sale. 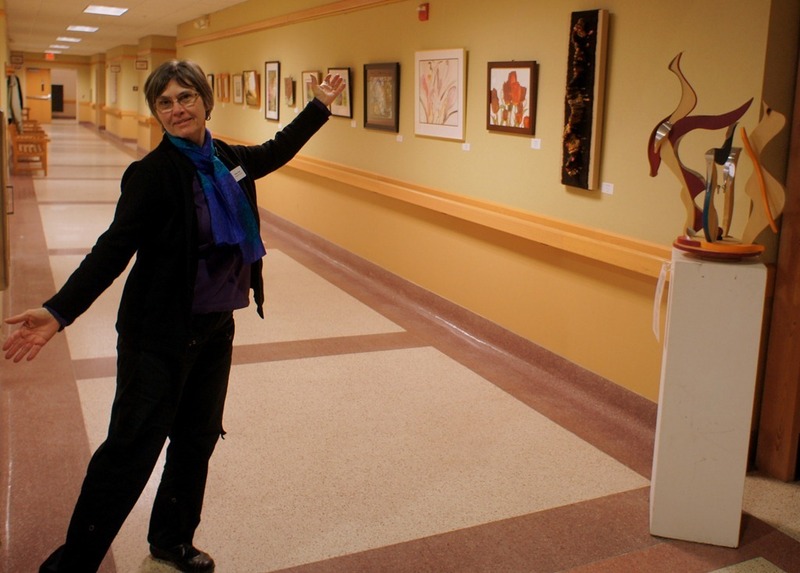 Joyce Francis is an artist with a passion for a newly discovered medium: gel printing. She writes, “I got hooked in early June and have spent the entire summer totally obsessed with gel-plate printing. This mono printing process is full of magical surprises. Even though the artist has control over the design idea one never knows for sure what will be revealed when the paper is pulled off the plate. The possibilities are endless. “ Francis will be demonstrating this process at the opening reception on Sept 9. I blogged about Joyce on my Locally Grown Northfield blog back in May 2007 when she displayed her calligraphy at the HideAway. 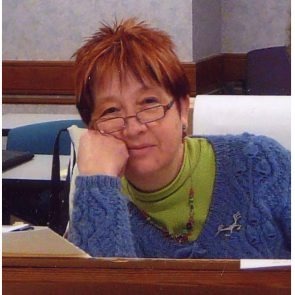 Northfield Patch had an article about her artisan bookmaking back in January of 2012.